Politics is popular culture and popular culture is politics. The visual change signaled a change in the Joker's inner mechanism. Nicholson's dandified virtuoso of violence was replaced by a darker, more unpredictable and psychotic figure. What had been a caricature became more real and threatening. An urbane mocker of civilized values became simply a deformed product of urban violence. It is the latter makeup job that has been superimposed over the face of President Obama in an anonymous Los Angeles poster campaign that is now the talk of the blogosphere, the airwaves and the 24/7 hermeneutical speculations of cable television. The image, which appears above the word "socialism," delights and distresses people roughly on the lines of the usual political cleavage, with wide agreement that the as-yet-unrevealed artist certainly intends it to be disrespectful. But there is little consensus about whether it is effective as political messagemaking. Comparisons to Shepard Fairey's Obama posters, which rendered the president's face a boldly contrasted palette of red and blue above the blunt message "hope," generally tend to favor Fairey's artistry. The exhausted icon of last year's political campaign, now falling off bumpers and fading on T-shirts, had both a subtlety the current poster lacks and a simplicity that it desperately needs. Fairey's image included a clever visual play on red- and blue-state political values (a windmill rendered in red, a tank and dollar sign sketched in blue), but it required only one step of mental grammar: Obama is hope. The new Obama poster has two basic thrusts. Obama is a socialist, or a crypto-socialist. And Obama is somehow like the Joker, unpredictable and dangerous. But joining these two messages together yields more questions and contradictions than good poster art can sustain. The Joker is violent and dangerous, but a socialist? And didn't we see George W. Bush depicted as the Joker not so long ago? Yes, in an image by Drew Friedman published online by Vanity Fair on July 29, 2008. That drawing at least played into a view of Bush popular among his detractors, that the former president was unpredictable and fast on the draw when it came to geopolitics. But the danger many of Obama's detractors detect is more of calculating, long-standing deception, that he is quietly and secretly marshaling a socialist agenda, a view that would be better served by imagery that recalled "The Manchurian Candidate." Even the first claim, that Obama is a socialist, isn't introducing anything new into the argument. Obama's opponents, in Congress and among pundits, have already raised the specter of socialism. The great virtue of an anonymous poster campaign is that it anticipates unspoken fears or claims, and leads the debate by insinuating and teasing out ideas that would be too explosive or alienating if simply dumped into the public forum by responsible actors. Good posters lead on the viewer and tease us with hints about the unseen hand that has crafted the image. 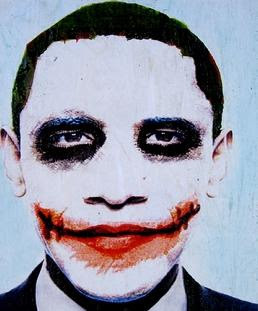 The Obama Joker poster leaves you with the sense that it has said everything it has to say, and waits only for the media to endorse the message through the legitimizing process peculiar to our new age of rapid-response journalism: that we are talking about it because you are talking about it, which means it must be worth talking about. The Joker's makeup in "Dark Knight" -- the latest film in a long franchise that dramatizes fear of the urban world -- emphasized the wounded nature of the villain, the sense that he was both a product and source of violence. Although Ledger was white, and the Joker is white, this equation of the wounded and the wounding mirrors basic racial typology in America. Urban blacks -- the thinking goes -- don't just live in dangerous neighborhoods, they carry that danger with them like a virus. Scientific studies, which demonstrate the social consequences of living in neighborhoods with high rates of crime, get processed and misinterpreted in the popular unconscious, underscoring the idea. Violence breeds violence. It is an ugly idea, operating covertly in that gray area that is always supposed to be opened up to honest examination whenever America has one of its "we need to talk this through" episodes. But it lingers, unspoken but powerful, leaving all too many people with the sense that exposure to crime creates an ineluctable propensity to crime. Superimpose that idea, through the Joker's makeup, onto Obama's face, and you have subtly coded, highly effective racial and political argument. Forget socialism, this poster is another attempt to accomplish an association between Obama and the unpredictable, seeming danger of urban life. It is another effort to establish what failed to jell in the debate about Obama's association with Chicago radical William Ayers and the controversy over the racially charged sermons of the Rev. Jeremiah Wright. Obama, like the Joker and like the racial stereotype of the black man, carries within him an unknowable, volatile and dangerous marker of urban violence, which could erupt at any time. The charge of socialism is secondary to the basic message that Obama can't be trusted, not because he is a politician, but because he's black.